Fun game for versus play. Bad game for score play. I 1CC'd Story Mode for the first time tonight. 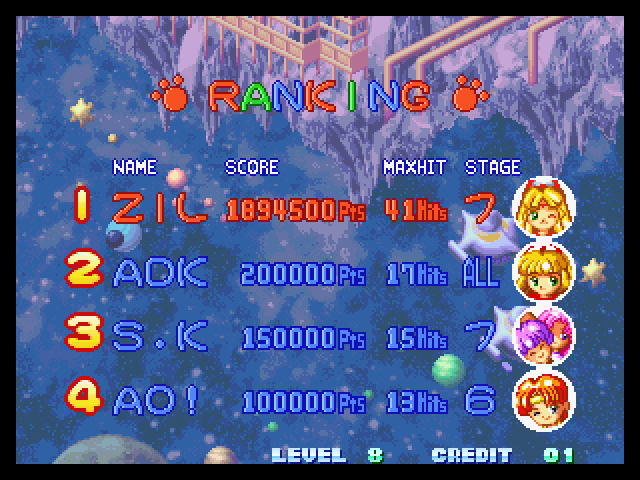 First time in my life I have 1cc'd anything so I'm quite chuffed! Congrats! Might I add that that is a sweet looking cab there ! Would anyone be interested in sharing any strategies (perhaps in the strategy forum)? I seem to be hitting a pretty consistent wall between 1.1 and 1.2 million. My latest tactic has been to try for big combos at any cost... But I'm not sure the risk/reward is working in my favor. 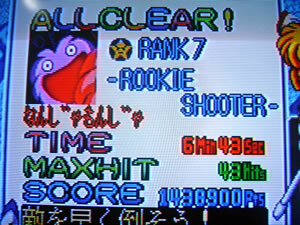 I read at least one account of a 4 million score on a Japanese site - if true, it would mean there's plenty of room for improvement. EDIT: Just checked the Hall of Records thread, which confirms a score of 4,007,569. In any event, new Story Mode score... This time playing on Dreamcast. There's not really much advice I can give for this game other than beat the first 5 opponents without losing a life and then milk Mevious and Memory for as much as you can. And don't break your coin chain of course. I think this game has some secrets that we don't know because sometimes when you fight Mevious and Memory they'll be almost invincible, which is what you want. BTW, that 88 hit chain in your picture is absolutely enormous mate! Do any of you try to milk any of the first 5 characters or do you try to nail them as quickly as possible for the higher time bonus? In one occasion I came out of the 1st enemy with over 200K, having somehow triggered a MAX CHAIN against it. As much as I tried to replicate that I was never able to do it, so I have no idea what I did. The first enemies die like retards all the time. I think time bonus is negligible in the long run. Aim for AT LEAST 100k points per battle. This is pretty much everything I do. Some of the formation patterns should be skipped for speed, on that page I always skip #8 because it's too slow--it's much better to shoot them and bring on the next one as quick as possible. I aim for 100k per battle in the first 4 rounds, then the game picks up. Throw all of your 4 lives away at Memory - the 100k remain bonus after beating her is easily eclipsed by the huge rallies you can have with her on each life. One thing that would be useful is figuring out how to intentionally send the game into speed overdrive, since that sustains combos really well. 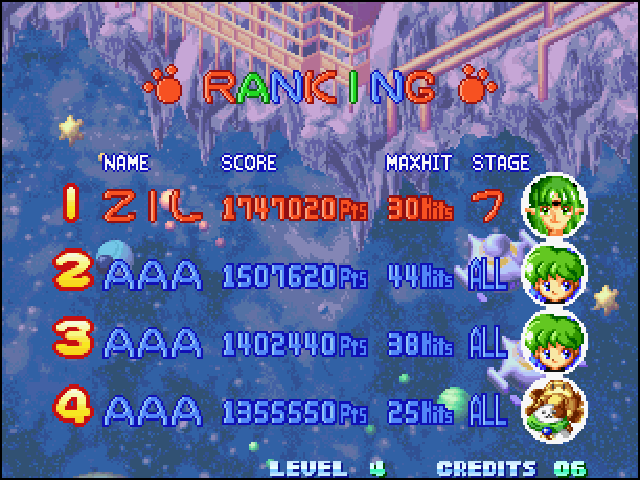 I got bored of 1cc every time at 1-4 in Character Mode so I decided to up the difficulty level to 1-6 and try again. 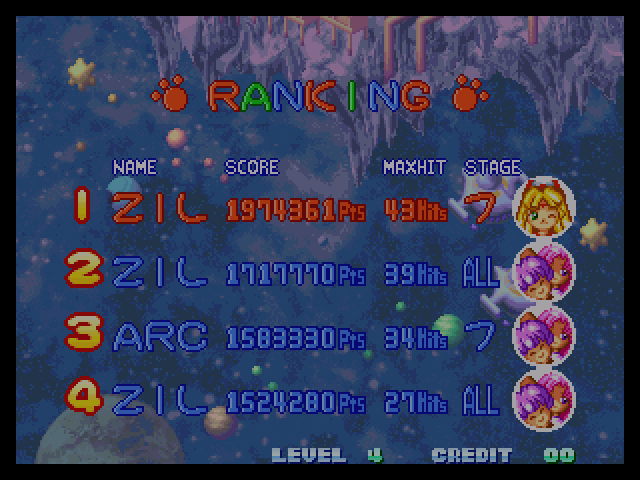 Took just two attemps to 1cc it again in Character mode so I upped the difficulty to the 1-8 max. 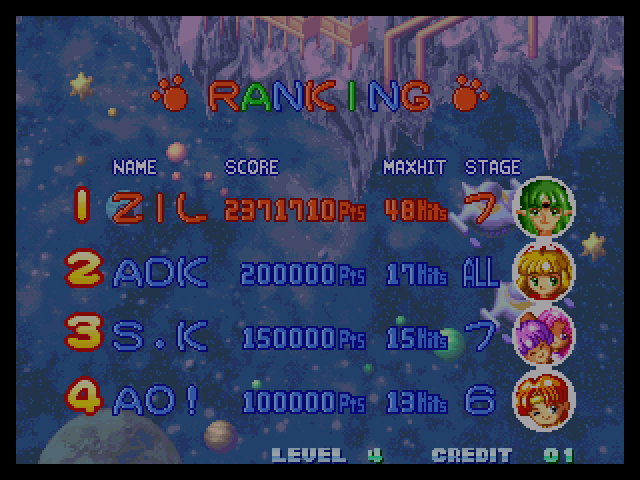 Took me just 2 days to 1cc it again so I swapped to Story mode. Incidentally, that IS my high score. I'll knock it back down to level four for my next submission. Oh, by the way, there's a typo in the character mode scoreboard. The last entry says "Load Run," which I assume should be "Load Ran." Well this is clearly superior. I should play 8 exclusively. The last entry says "Load Run," which I assume should be "Load Ran." Yeah, I think I must have transplanted that mistake over from the old thread. 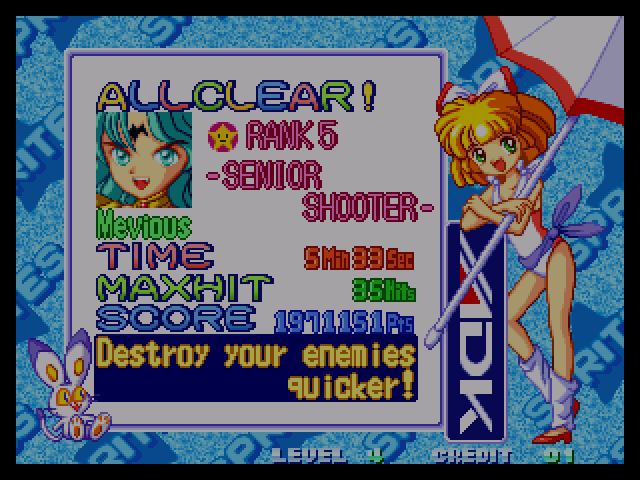 I can't remember where, but I'm about 90% sure that some version of the game makes the run/ran translation mistake somewhere... Nice scores regardless. EDIT: Can someone with lagless MAME please watch shadowbringer's character mode run and tell me how he ends up with a 1 at the end of his score? I'd watch it myself but I don't have a computer >_>. And then it seems every one gives 2,304 thereafter, meaning it would be wise to reset them. I'm not 100% sure about these, but the 1 happens consistently. 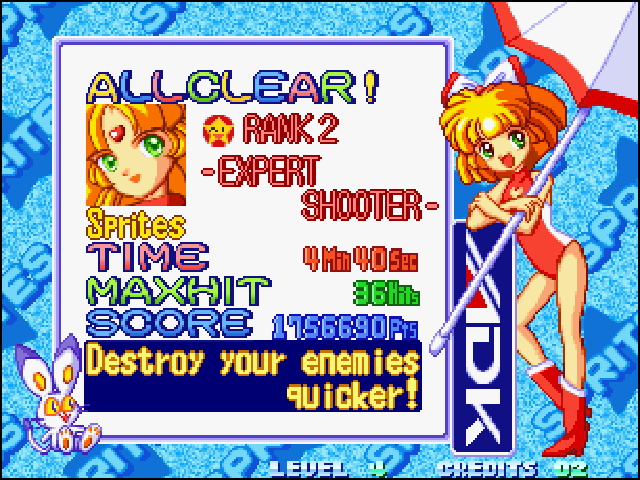 So that's where those mysterious single digits come from, I'm crap at getting perfects so it never happened for me. Thanks for taking the time to research this, I'll add the info to the OP. Great job, congrats on breaking and exceeding 2 million. Can someone confirm the default values? I've just changed the BIOS back to the stock USA one and now I start with 5 lives or something as opposed to the usual two in Japan mode. All I have is that screenshot, so I can't truly prove that I played with default lives, if that's what you mean. But here's what I'll do. From now on I'll stream every run I do on twitch, so I'll have recordings after. Sorry d00d, that wasn't directed at you. My default settings have changed with a change of BIOS. I have 5 lives now as opposed to 3. I just wondered what the corrcet default number of lives is.